This fs was started in January 2012. I didn't remember that of course, I just checked the created date. Similarly, who-the-fun can remember what the inspiration was for it. All I know is that it has gone through many iterations to reach this state. It only uses the one square brick but oh so many of them. Even though all it contains are straight lines, still a pain to build brick by square brick. I am so glad it is over. I will not be doing much more than this on it. Bye bye, Build. Pester someone else. Info: Created on 17th January 2012 . Last edited on 3rd June 2015. Congratulations! FontStruct Staff have deemed your FontStruction worthy of special mention. 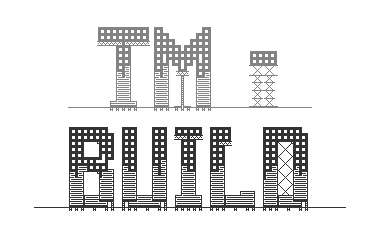 “tm - and Build” is now a Top Pick. Congratulations on the TP,this font is so much fun! The P--R combination is wonderful and the commas and Q so clever. Very nice pixel work. I especially like the scaffolding and the underground constructions at Q, coma, and semicolon. Consider adding cranes for special characters, e.g. hash, parenthesis, etc. I really do appreciate all your comments.